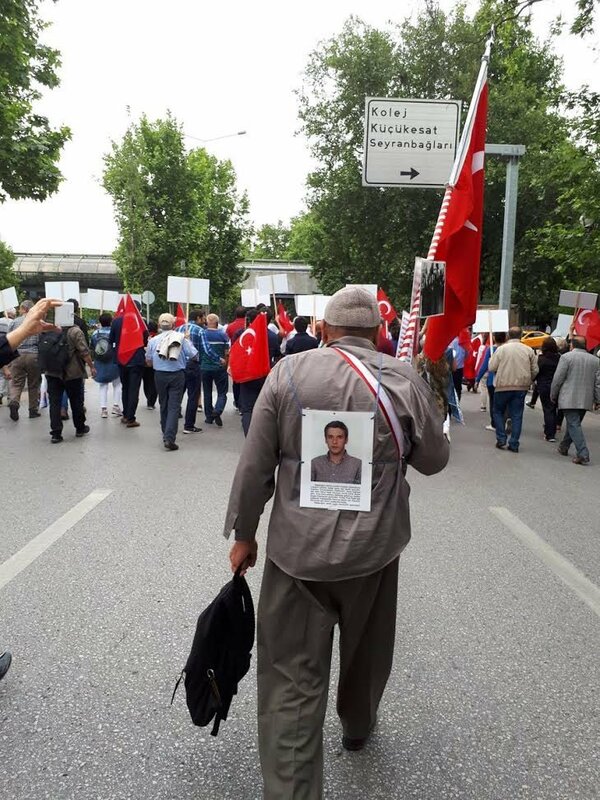 A 60-year-old Turkish man whose son has been kept in İstanbul Silivri Prison for over 10 months on coup charges, attended a “March of Justice” kicked off by the main opposition Republican People’s Party (CHP) on Thursday in order to demand his son’s release, Sözcü daily reported. 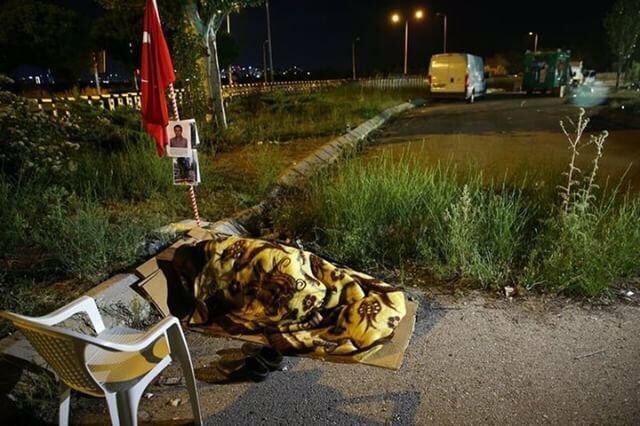 The daily identified the man as “Veysel Amca” (Uncle Veysel) and reported that he has been holding vigil since August 2016 in front of İstanbul Çağlayan Courthouse to protest his son’s arrest and came to Ankara early on Thursday to attend the march. Uncle Veysel’s son was Air Force Academy student and arrested after July 15 coup attempt on charges of attempting to eliminate the constitutional order, attempting to overthrow the Turkish government and the Parliament by use of force and membership in a terror organization. CHP on Thursday kicked off a “march of justice” from Turkey’s capital Ankara to İstanbul in protest of the arrest of CHP deputy Enis Berberoğlu on Wednesday. CHP leader Kemal Kılıçdaroğlu arrived at Ankara’s Güven Park, where the party began the march, on Thursday with a banner in his hand that read only one word: justice. At the first day of the protests, Kılıçdaroğlu walked a total of 18 km. A high criminal court in İstanbul on Wednesday handed down a prison sentence of 25 years to Berberoğlu over a report on National Intelligence Organization (MİT) trucks, sending him to prison immediately after the ruling was announced. Kılıçdaroğlu who spoke to reporters at the Güven Park, said: “We are faced with a dictatorial regime in our land in Turkey. We say, ‘enough is enough.’ Justice has to come to this country. If there is a need to pay a price for this, first, we will pay that price. We need to struggle altogether for the future of this country,” said Kılıçdaroğlu. The CHP’s “march of justice” is expected to last for 25 days and end in front of the Maltepe Prison in İstanbul where deputy Berberoğlu is being held. “This march has nothing to do with a political party. Justice, justice, justice. We don’t want a dictatorial regime, we don’t want coup makers, we don’t want those who staged the July 20 coup. We don’t want to live in a country where there is no justice,” said Kılıçdaroğlu. Turkey survived a military coup attempt on July 15, which claimed the lives of more than 240 people and injured a thousand others. Immediately after the coup attempt, the Justice and Development Party (AKP) declared a state of emergency on June 20, which is still in effect. Kılıçdaroğlu refers to the declaration of the state of emergency as another coup because the government has jailed thousands of people and purged thousands of others from state posts on coup charges. In the meantime, the arrest of Berberoğlu, who would normally enjoy parliamentary immunity, was possible because the CHP and Nationalist Movement Party (MHP) had lent support to a proposal submitted by the ruling Justice and Development Party (AKP) on removing the immunity deputies from prosecution last year. The immunity of all deputies who face probes was lifted in May 2016. Currently, 11 HDP deputies are in jail on charges of terrorist links.